Originally called the Crean Mine, located south of the Algoma branch of the Canadian Pacific Railway, Evans Mine was named after John Dunlop Evans, an engineer and surveyor, and one of the early managers of the Canadian Copper Company. In the summer of 1889 the mine was being developed and had reached a depth of 85 feet (26 meters). A large rockhouse was built, hoisting and other necessary equipment installed. Eight or ten wooden houses, clap-boarded and plastered, were built to provide accommodation for the miners and their families. November 29th to Evans Mine to see several buildings under construction. 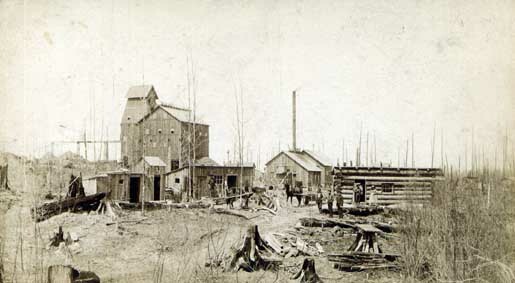 In March of 1890 a proposal was in place for a new railway line from Copper Cliff to Evans Mine; March 17th, boarding houses at Evans; August 19th, 1891 work progressing on new road to Evans Mine. From the 1891 Census of McKim, John Evans was a lodger at a boarding house run by Maggie Thompson, a widow. John, age 48, born in Ontario, parents born in England, Church of England, was Manager for the Canadian Copper Company. Also living in the same boarding house were George Stoddart, age 25, born in England, Church of England, carpenter; and William McGee, age 31, born in Quebec, parents born in New Brunswick, Free Will Baptist, machinist. The mine operated for ten years until 1899. In June, 1892, in company with Mr. Fletcher, who was anxious to obtain Erebia Discoidalis, Kirby, a Red-disked alpine (small butterfly is blackish-brownwith a distinctive orange-red patch on the forewing), I made a visit to the famous Sudbury mining region. Leaving Ottawa on the 15th, at 3.40 p.m. we arrived at Copper Cliff at 5 a.m. the following day. As the hour was so early we tried a little collecting before calling on our friend, Mr. J. D. Evans, manager of the copper and nickel mines, who had kindly invited us to stay with him. J. D. Evans was a member of the Ottawa Field Naturalist’s Club. The pioneers in the early days of Evans Mine were the Hambleys, McGees, Johns, Lecks, Websters, Charles Ade and John Gribble, among others. Music played an important part in the life of the settlement. 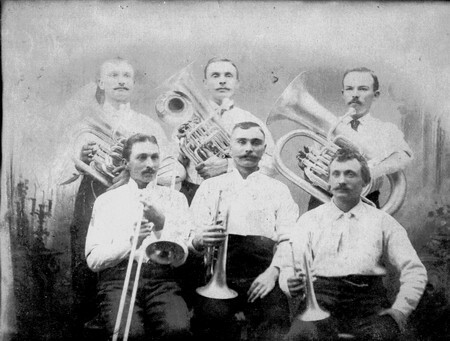 The Copper Cliff Brass Band had its inception at the Evans and Copper Cliff mines in the early 1890s when a few pioneer players, Capt. William John Hambley, William Johns, John Redington, George Leck, Chas. Taylor, Thomas and Henry Stoddard provided music at the local picnics and football games, and at times competed against the Sudbury Band. From 1895 and during the early 1900's to 1905 the band had a membership of 25 under the leadership of William Johns; later on John Gribble assumed leadership and the band was always in evidence at all public holidays and sports events. A very successful oyster supper and entertainment was given at the Evans Mine, Saturday, 6th, under the auspices of the Methodist Church. The programme was excellent and well rendered. Copper Cliff has great reason to be proud of their band. The ladies and friends of the Evans Mine deserve great credit for the way in which they provided and managed the whole affair. The supper, seating and entertainment was well managed by the business tact of Captain James Foreman Hambley and Chief Clerk from Copper Cliff, H. B. Paull, Esq. The Sudbury Journal February 11, 1892. From the Old Timer Tales #681 are recollections of Albert Forsyth. "Frozen dynamite was much more dangerous than under normal temperatures in 1898. That was at the Evans Mine in the winter of 1898-99. There were probably a dozen sticks in the centre of a box which were not frozen. These were used at once in the mine and the balance placed on a shelf in the frame powder house beside the blacksmith shop, to freeze still harder. We had been asking for a thawing can all winter, thought there was one not in use at the cliff. Old Cap Davis would not send it over to us on account of the cost, about $5. And so the frozen dynamite kept accumulating in the powder house and the danger of an explosion kept increasing. A thawing can was one large can with a smaller can hanging from the top inside it. The frozen stuff was placed in the small can and the large can filled with hot water. Cap Davis came over on regular days and his time of arrival was always at the same hour. One day I built a roaring fire in the old box stove in the office. The temperature was 40 below zero outside. A few minutes before the captain was due to arrive I carried about two boxes of the frozen dynamite in and laid it carefully on the floor around the stove. I had barely finished when I heard the sound of sleigh bells and braced myself for what was coming. Old Cap came stomping in and threw open the door. ‘Good morning’ he said, then “My patience!” (his favorite cuss expression). Forsyth, what does this mean? Well, I said, what can we do. We have no thawing can and it has to be thawed some way. ‘Get it out of here’ he yelled as he dashed for his cutter... In half and hour we had out thawing can!" In the 1901 Census, Evans Mine was located in Snider and Waters Township, Nipissing District. Wilhelm ‘William Charles’ Ballenstaedt arrived in Canada 1886. On October 14th, 1890 he married Wilhelmine Behnke at Petawawa. From the 1901 Census of Evans Mine, Will Ballstedt, age 38, born September 28th, 1862 in Germany, Lutheran, Journalier, employed for 12 months earning $440., his wife Mena, age 30 and their children Mary, age 10, Emila, age 8, Charly, age 6, Sharman, age 5, August, age 3 and Paul, age 1. From the 1901 Census of Evans Mine, Jean Blacburn [Blackburn], age 48, born December 8th, 1852 in Quebec, Scotch origin, Roman Catholic, ‘Journalier’ [day labourer], employed for 10 months earning $675., his wife Flora, age 39, born February 3, 1862 in Ontario, and their children Joseph, age 20, born October 23rd, 1880, ‘Journalier’, employed for 6 months earning $200., Thoddaige Catherine, age 14, born February 26th, 1887, M. Cordelia Eleonore, age 12,born January 1st, 1889, Adelina Isabella, age 9, born May 15, 1891, twin with Peter, also born 1891, (not listed in the census), R. Alba, age 7, born August 1st, 1893, Joseph Victor Pierre, age 4, born in August 15th, 1896, M. Demerisse, age 2, born May 30th, 1898, and boarders Eusebe Deault, age 18, born in the United States, Lumberjack, Austare Manette, age 23, born in Quebec, Lumberjack and Samuel Richard, age 47, born in the United States, Lumberjack. Other children were Marie Louise Hedwidge born in 1882, Emma, born in 1885, Marie Clarisse Julia, born in 1887, M. Alice Georgina, born 1901 and Joseph Jean Blackburn born in 1905. 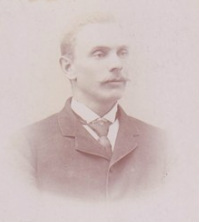 Edward Crithmans’ parents were Jacob Crithmann and Fredrika Hawkins. Edward’s wife was Mary Benke. Mary’s parents were Angust Benke and Minnie Nast. Edward and Mary were married August 17th, 1897 in Nipissing District. From the 1901 Census of Evans Mine, Edward Crithman, age 29, born April 8th, 1871 in Willing Russia, immigrated in 1892, Lutheran, Miner, employed for 12 months earning $700., and his wife Mary, age 24, born in Pembroke, their son Edward, age 5 months and boarder Irvine Morreson, age 48, born in Quebec, Miner, employed for 12 months earning $480. From the 1901 Census of Evans Mine, George Delaney, age 39, born April 30th, 1861 in Quebec, English origin, Roman Catholic, occupation ‘Journalier’, employed for 12 months earning $440., his wife Delia, age 22, and their children Lina, age 2, born in Ontario and Thomas, age 10 months, born in Quebec [nephew?] and Alfrede, age 8 months, born in Ontario, and Levesque Wina, age 15, Domestic, employed for 10 months earning $100. 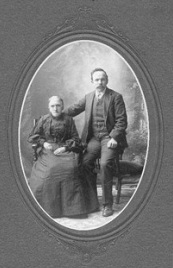 On May 21, 1892, John Gadender, age 23, a miner from Finland married Liezie Hiokkees, age 27, from Finland. Both were residents of Evans Mine. A witness was Alex Henderson of Evans Mine. Gerald Leonard Gallagher, son of John Gallagher and Johanna Egan was born April 14th, 1897 at Evans Mine. Other children were Clarence ‘Charles’ born in 1893 in Quebec, Joseph Alphonse born September 18, 1900 in Copper Cliff, Irene Mary, born March 28, 1904 in Copper Cliff, and Lawrence Gabriel born March 19, 1909 in Crean Hill. From the 1901 Census of Evans Mine, George Griffen, age 60, born May 31, 1840 in England, immigrated in 1897, Methodist, Miner, employed for 10 months earning $440., his wife Jane, age 57, son Thomas, age 20, Lumberjack, employed for 11 months earning $650. and J. Shaney Duggan, age 16, Miner employed for 12 months earning $665. Thomas Hambley was born February 10th, 1849 in Chagford, Devon, England. He died October 10th, 1901 in Creemore, Ontario. 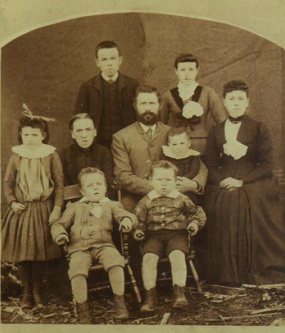 At the time of the census in 1891, Thomas lived with his wife Sarah Northmore and family in Schreiber. Thomas was a miner. Their children were William John, age 17, born in Maine, USA, Sarah Jane, age 16, born in the USA, Mabel, age 10, Thomas, age 7 and Lottie, age 4. David Johns, age 26, lived with the family. 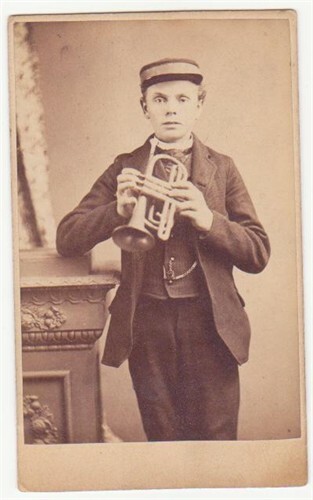 Son Francis Sidney died at three years of age in 1888. Daughter Mabel eventually married John Redington. Daughter Rosa married William Thomas Johns. From the 1901 Census of McKim Township, Thomas Hambley (Thomas’ son), age 17 was a boarder with his brother-in-law and sister, John Redington, age 27, his wife Mabel, age 20, and their daughter Ivy, age 10 months. Thomas was an engineer. He rose in railway circles to become general superintended of the Algoma Division of the Canadian Pacific Railway. From the 1901 Census of Evans Mine, William John Hambley (Thomas’ son), age 26, born May 13th, 1875, American, Methodist, Miner, employed for 8 months earning $420., with his wife Ella Harris, age 22, son Willie, 3 months, and Bessie Harris, age 10, daughter [sister]. From the 1911 Census William John ‘Capt. *’ Hambly (Thomas’ son), was married to Edna Kilby, his second wife, and living in Snider Township. Their children were William Arthur, age 13, Eleanor Mignon, age 9, Joseph Marvin, age 6, and Fredrick A., 9 months. William J. Hambley, mining boss became the Copper Cliff town clerk and treasurer. Signaling his 45 years of highly valued service to Copper Cliff churches and choirs, W. J. "Cap" Hambley was the recipient of a handsome hymn book in a brief presentation at the United Church February 21, 1937. Mayor Collins made the presentation. *Among Cornish folk, mine superintendents were known as Captains. Isaac Hayes of Evans Mine was a witness to a wedding in Copper Cliff on September 24, 1892. Two sons of Samuel James Johns and his wife Catherine Lawry of Cornwall, England lived and worked at Evans Mine. Samuel James Johns, son of Samuel James Johns was born January 8th, 1866 in St. Cleer, Cornwall. After moving from Dickinson, Michigan about 1890, Samuel Johns and his wife Eliza Ann Jones, lived in Evans Mine until 1899. Their daughters Olive Catharine, born on November 3rd, 1892; Florence; Cora May, born May 24th, 1894, and son Carman were all born in Evans Mine. Two other daughters and two sons were born in Michigan. William Thomas Johns, son of Samuel James Johns was born October 21st, 1868 in St. Cleer, Cornwall, England. He married Rosa Hambley at Evans Mine on December 22nd, 1890. At the time of the census in 1891 William lived with Rosa at Schreiber. William was a miner. Rosa was born July 5th 1871 in Chester, Massachusetts, and died March 5th, 1947 in Hamilton Ontario. Shortly after the census William and Rosa moved to Evans Mine. William Thomas Johns (Sr.) lived to the age of 39. He died September 15th, 1907 in Toronto. His death certificate identified his occupation as ‘musician’. William Thomas Johns, William and Rosa’s son was born October 22nd, 1891 in Evans Mine. Daughters, Harriet Emily and Sarah Idella were born July 12th, 1893 and December 26th, 1896, respectively, both in Evans Mine. Samuel Kidd was born March 22nd, 1849 in Ireland. In the 1891 Census of McKim and Chisholm sub-district of Nipissing, Samuel Kidd, widower, age 43 is a lodger in the home of Charles Collins, with his daughter Margeret, age 7 and son James, age 6. Sam Kidd, first came to Copper Cliff in 1892 and worked at the Evans Mine. He later joined the Mond Nickel Co. and retired on pension in 1929. He died in Sudbury on August 28th, 1933. From the 1901 Census of Evans Mine, Mary Ann Bartraw Martin, Widow, age 39, born April 18th, 1861 in Ontario, origin French, Methodist, occupation ‘Ménagaise’, sons William John Martin, age 15, Miner, employed for 9 months, earning $440., Donald Alexander Martin, age 12, Miner, employed for 9 months, earning $400., daughter Mary Ann (Minnie) Martin, age 8 and son Alfred Edward Martin, age 6. From the 1901 Census of Evans Mine, Rory McCorrmick, age 21, born December 13th, 1879 in Sudbury, Scotch origin, Roman Catholic, ‘Journalier’, employed for 12 months earning $620., his wife Hattie Catherine McDonald McCormick, age 25. William McGee was born February 28, 1852 in Ireland. From the 1901 Census of Evans Mine, William was a miner, employed for 12 months earning $690. William emigrated in 1884. He lived with his wife Mary Sarah and their ten children: Clara, age 22, John, age 21, Smith, employed for 12 months earning $600., Thomas, age 20, Smith, employed for 12 months earning $600., A. William, age 18, Lilian, age 14, J. Albert, age 13, Clara Eleanor, age 12, Idas, age 11, Gilbert, age 9 and Martle, age 5. An older daughter Sarah Ann, born August 12th, 1878 in Arlecdon, Cumberland, England married John Gribble on August 12, 1901. Sarah Ann died November 12th, 1903 in Copper Cliff. In 1914 William McGee was a hoistman and lived at 215 Clara Belle Road. From the 1891 Census of McKim Township, Thomas Charles Smiles, age 32, born in Quebec, English origin, Boarding House Keeper, his wife Elizabeth, age 32, born in Ontario, Irish origin and their children all born in Ontario, Harold, age 5, Ida, age 3 and Stanley, age 1. 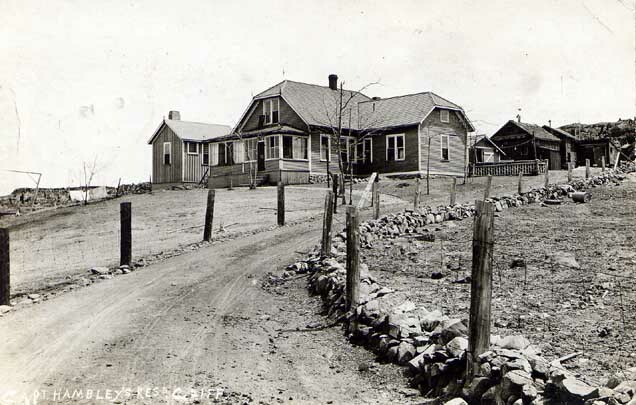 Living in the boarding house were Mary Sweeney, age 22, born in Ontario, domestic, Jane Brises, age 22, born in Ontario, Domestic and Lodgers George Neil, age 22, born in Ontario, Irish origin, General Labourer and Dryden Smith, age 25, born in Ontario, Miner. From the 1901 Census of McKim Township, Thos. Smiles, age 42, born Allumette Island, Quebec, English origin, Cooker, employed for 12 months earning $600. ; his wife Elizabeth ‘Lizzie’ Frances [Roe], age 41, immigrated in 1860 and their children Lizzie, age 18, Ida, age 16, Harrold, age 14, Stanley, age 10, Hilda Cecil, age 7 and lodgers Nickless Roe, age 46, born in Ireland, Mine Labourer, employed for 12 months earning $450. ; George Roe, age 18, born in Ontario, Irish origin, Teamster, employed for 12 months earning $560. and Jack Roe, age 19, born in Ontario, Irish origin, Teamster, employed for 12 months earning $500. From the 1901 Census of Evans Mine, Simon Webster, age 48, born December 12th, 1852 in England, immigration year 1885, Anglican, ‘Journalier’, employed for 12 months earning $800., his wife Elisabeth, age 42, son Sam, age 16 ‘Journalier’, employed for 12 months earning $650., Norman, age 12, Mary, age 10, Francois, age 8 and Frediric, age 4.